You can use GitHub Enterprise's Automatic Page Generator to quickly create a single page website for a project, user, or organization. The Automatic Page Generator is designed to create single page websites. If you're interested in building a multi-page website, we recommend using Jekyll. To add multiple pages to your Automated Page Generator site as a workaround, you can try copying the index.html file in the root of your repository and editing it as a template for other web pages. This workaround requires some familiarity with HTML. Note: If you set your GitHub Pages source setting to publish your site from /docs master branch (a /docs folder on your master branch), the Automatic Page Generator will be disabled. For more information, see "Configuring a publishing source for GitHub Pages." To generate User and Organization Pages sites, you'll need to create a repository named <username>.[hostname] . The username or organization name must be your own or your GitHub Pages site will not build. The automatic page generator is accessible via the repository's Settings page. You can read more about User and Organization Pages. 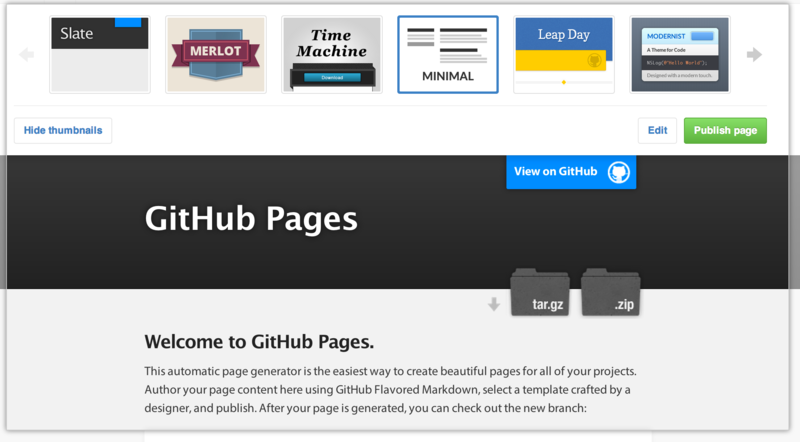 You can use the automatic page generator to publish GitHub Pages sites for any project repository. Warning: You must create the repository with the naming convention described above or you will not be able to publish your GitHub Pages site. Click the Automatic Page Generator button. Author your content in the Markdown editor. Preview your content in our themes. When you find a theme that you like, click Publish page. remote: Counting objects: 92, done. Unpacking objects: 100% (68/68), done. Branch gh-pages set up to track remote branch gh-pages from origin. If you generated a User Pages site, the code lives in the master branch instead of the gh-pages branch, so just check out master and then pull! Receiving objects: 100% (424/424), 329.32 KiB | 178 KiB/s, done.